A wardrobe miracle happened this week (no, not that I matched, although that did happen too!) 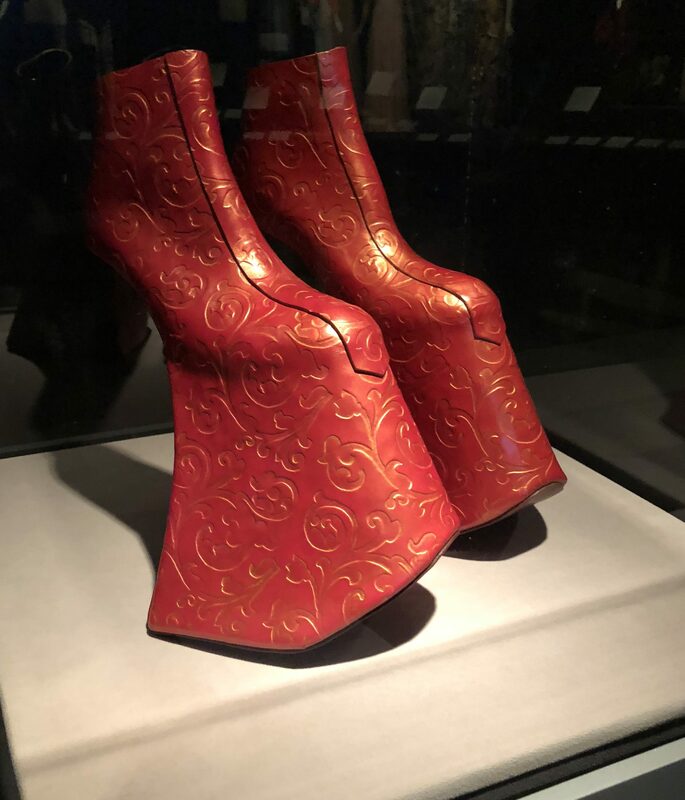 I found a pair of pants that fit at the ankle. Of course they were actually meant to be capris, but that’s the story of my life. These kept me warm enough on a chilly day that I hope I have a “tights” solution for next winter. Pocketopia, I think I love you! Monday: chasing an earworm is #nevermissamonday, right? I was at a coffee meeting and Maren Morris’ The Middle was on and in my head for an hour. Ooph. Somehow segued into Stay Alive from Hamilton. I love it and it is on my playlist, but I hadn’t had that on since Tuesday? No idea. Tuesday: been a while since I did a double workout. Plan was to run 2-3 miles before a morning meeting that featured an awesome cycling exhibit, but the snooze button won and only ~ mile and a half happened. After work I went back to the gym for the 1.5 mile balance and a decent progression: 5.5, 5.6, 5.7 and 6.0 to close. It felt good. Wednesday: hopefully penultimate PT. As I said to Greg when I left, I’ll miss seeing him but I won’t miss needing to see him. While the hip is still an issue and I still lack in core strength, I understand what I need to do to keep the Achilles issue from recurring, I think/hope. He’s come to the conclusion I arrived at early — dead bug isn’t happening but I did the leg part. That coupled with planks and side planks left me with abs DOMS of doom until Saturday! Surprisingly, the weighted squats didn’t bother my knee or hip. Thursday: expo visit 1 in between meetings. More to come on that in race recap, but I did score this awesome, soft shirt to wear after the race. Never did figure out something green to wear Sunday. Oh well. It was an absolutely gorgeous day and I wanted one last run in before the Half despite office run group being a schedule casualty. 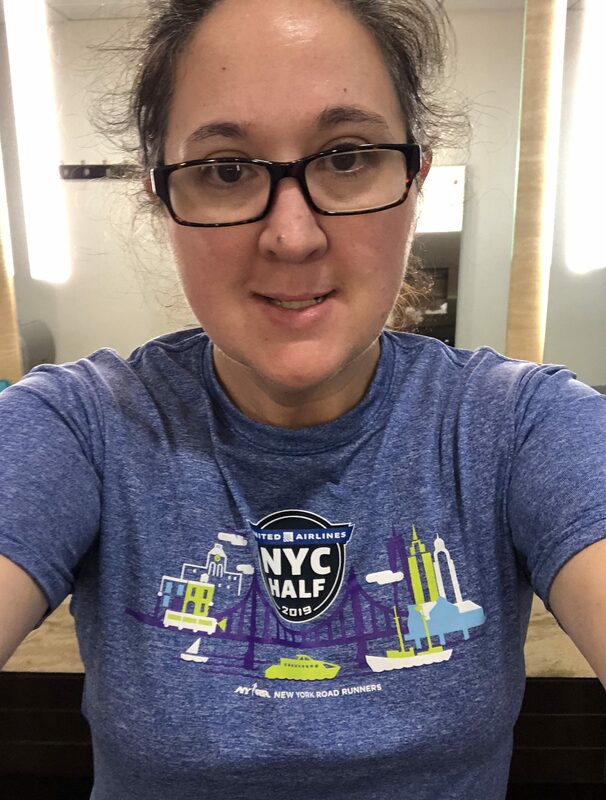 So I stored my stuff at the Run Center (also host to an adorable Rising NYRR/Team for Kids event) and hit Central Park. Wanted to do more than the standard ~5K loop and wasn’t confident in the state of the potholed reservoir so I ran the “wrong” way around the loop, crossing over at 102nd. This had the added benefit of avoiding going up Cat HIll. There was a gorgeous sunset, but alas my phone was in the RunCenter as it would have died anyway due to 9% The Achilles felt OK on the West Side rollers and just tender after. I iced it and took Advil, but it was OK by morning. Because I haven’t run at volume, my knees were sore on stairs Friday morning but otherwise OK. I’m confident I will finish Sunday. Saturday: errands, Expo with Darlene when she got into town. Try to tamp down the evening impostor syndrome butterflies with some avocado toast. Sunday: race day! Depending on post-race plans, this may post before I get home. I’ll update it ASAP, but I’ll likely tweet first. Done! Relatively pain free and definitely happy. More to come Tuesday. ETA: Recap is posted. Plans for the week: active recovery during crazy busy work week. So cool that you volunteered at the Expo. I remember the expo being super busy when I ran this race a few years ago so I’m sure it was a crazy day for you! Glad to hear that the race went well and can’t wait for your recap. That is fun that you volunteered at the expo. Congrats on the half today. Gorgeous day for it. Looking forward to your recap and photos. Thanks for linking up! I was not happy I didn’t get to enjoy that gorgeous weather. I was running a fever so actually felt chilled even though it was so warm. No pain is always the best! It truly is always my first goal. I don’t mind the tights (and I’m even shorter), but I guess it just all depends on where you’re comfortable with the waist being (I don’t mind a higher waist) and I also don’t mind having some scrunching going on at the bottom, either. Oh no, feel better! Hopefully we’re all about to get spring. I never fold over at the bottom, but I pretty much always scrunch. Looking forward to hearing about your race! My friend (from Ohio) ran it too. I LOVE that soft shirt you have with the shamrocks on it. That’s beautiful! I love this shirt. I may or may not have slept in it and then wore it to PT yesterday morning too. 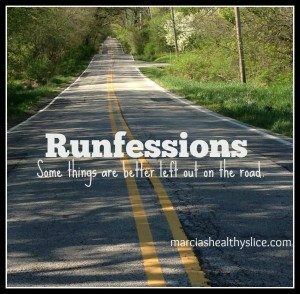 I am looking forward to your race recap! I’ve also volunteered at previous expos and they’re so much fun. Oooh can’t wait to hear how the race went! Good on you for volunteering too. That is a great shamrock shirt. 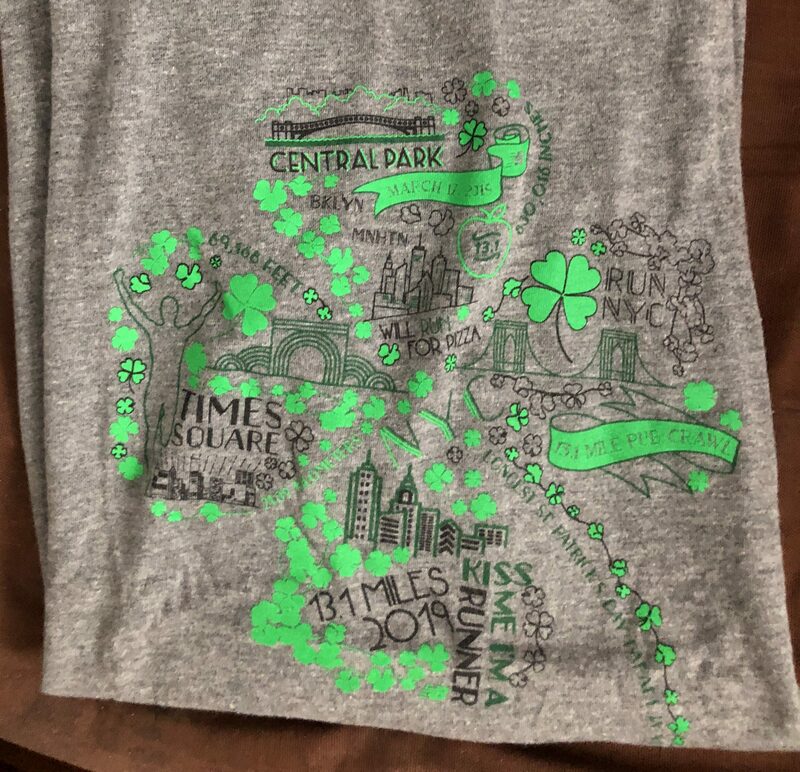 I’m realizing now that I’m running the Chicago Shamrock Shuffle next weekend and the only real GREEN shirts I have are short sleeved, which is not going to fly. I think Darlene said her (adorable) shirt was from Brooks and had overnight shipping, so maybe an option. I had nothing green so went with ridiculously different color scheme. I looked at a couple on Gone for a Run but none jumped out at me. I’m already living in the cotton shirt, I did the same for the Bronx one. They’re just a perfect soft comfy shirt for a lazy Saturday. Good luck with the Shuffle! Oh, so glad you’re happy and can’t wait to hear more! And great to see Darlene. I was stuck at a conference in a hotel basement during our gorgeous weather this week and now it’s COLD! Great to hear that you’re ready to wrap up PT. I need to look up what that “dead bug” is! Boo on the conference, but hope it was useful information. We can’t pick a season either but seem headed back into spring later this week. 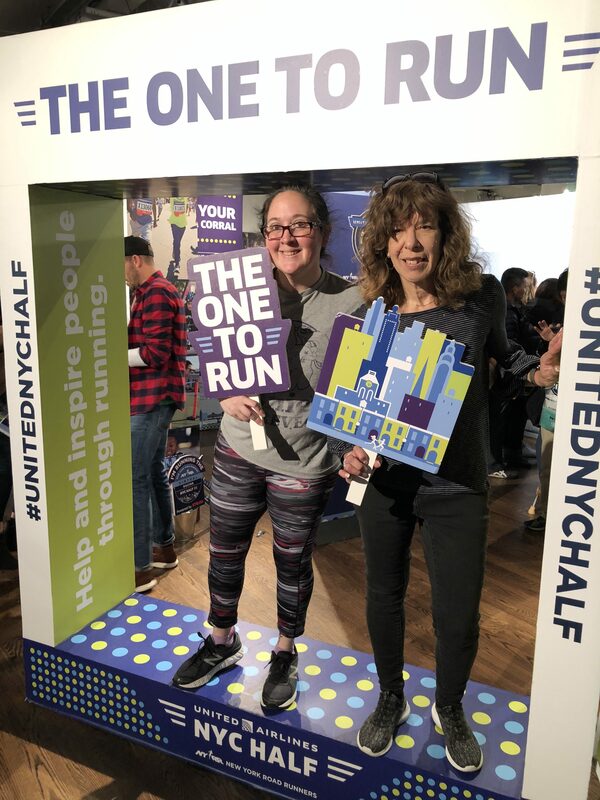 Congrats on finishing the NYC half! Loved your flat runner. I am all about everything Skirt Sports! Nice week leading into the race! I didn’t make it to the Expo until Saturday, too bad I didn’t get to see you there. All that NYC Half swag looked so good…if I was running it I def would have bought a couple things! Can’t wait for your race recap! Oh bummer we missed you there too. Would have been fun if we’d randomly run into one another. I found a colleague in a race of 25,000 so stranger things have happened. A great week and always love the flat Cari! What a super outfit. 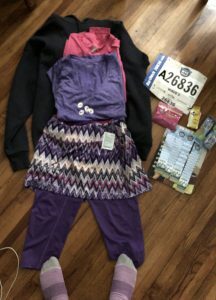 so a good week – I love the capris-not-capris and the NYC half shirt for after the race. 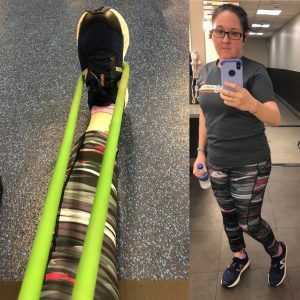 I think it’s good to graduate from PT – they can never really do 100% for us, we have to go off into the wild and do the exercises on our own if we want to prevent injury in the future right? I totally forgot about St Patrick’s (Bad American) and didn’t even think to wear green on Sunday. 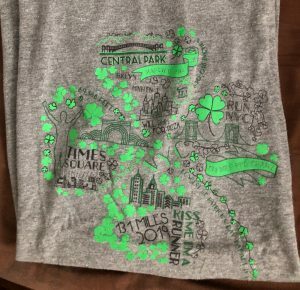 No one cares here anyway, but my stepmom is Irish (really, from Dublin) and I like to joke that that makes me part Irish too. 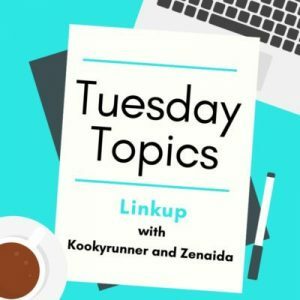 Going to finish up the WRD blog-reading and come back to your recap! Yup yup yup. Provide a good foundation and teach us how to move forward. You wore the correct outfit. I would have been more comfortable with long sleeves and capris. But I didn’t sweat so that’s a good thing. Again great hanging with you. Let’s do it again. I need to plan another nYC race before Nov 3. I think my body heat is just accustomed to capris into June. I didn’t change to shorts until late June last year. Only race I really was too hot in the capris was Lauderdale and that was unseasonable.